Captain Jeff Jessop checked in tonight with an update from the Freedom out of 22nd Street Landing in San Pedro, CA. We had a very successful overnight trip today. We caught 23 Yellowtail, 10 Bluefin Tuna (up to 215 pounds) and 6 Bonito. 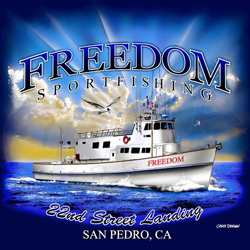 The Freedom is the premier overnight boat in SoCal. To book a spot please call our office at (310) 832-8304 or BOOK ONLINE.